The Marx Brothers, vaudevillian German-Jews from the now extinct Upper East Side neighborhood of Yorkville, had such difficult childhoods that they would have benefited from years of intensive therapy. But would they have been nearly as funny? As with the TARP stimulus package, it’s often hard to say what would have happened if something else hadn’t. I’ve loved the Marx Brothers since my father introduced me to them when I was 8 or 9 years old. I played hooky last week to catch a revival production of Animal Crackers, which recently played at The Lyric Stage Company of Boston. Sitting in the theatre, surrounded by giggling octogenarians (this was the 2 o’clock matinee, people), got me thinking about what made (and still makes) the Marx Brothers so sublimely wonderful, more than 100 years after their vaudeville stage debut. Sibling rivarly (off-stage, Zeppo was funnier than Groucho), a relentless stage mother, grinding poverty: all combined to push the brothers out of school as early as the first grade and into vaudeville. It was onstage, completely by accident—the cause of numerous advancements and discoveries throughout history—that the brothers stumbled upon and perfected their brand of irreverent slapstick humor decades before it became chic to mock the Establishment. Vaudeville, and the Marx Brothers’ influence on American comedic style and humor is vast: random examples include anything by Monty Python or Mel Brooks; movies such as Caddyshack, The Beatles’ Hard Days Night and Help; TV’s Saturday Night Live (its structure and skits), Jon Stewart & Stephen Colbert, sitcoms The Office, Modern Family, Larry David’s Curb Your Enthusiasm…basically anything that pokes fun at respectable society today got its start with the great Jewish comedians of the early 20th century. 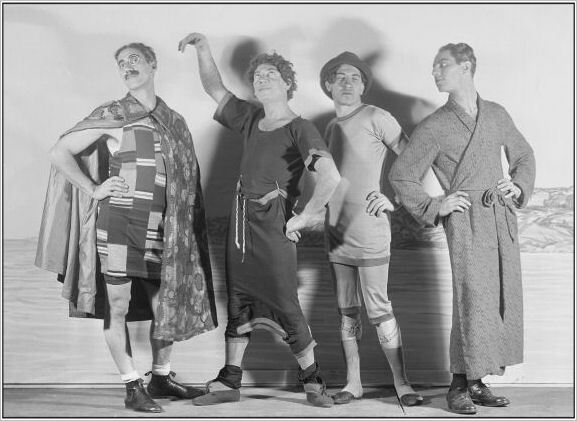 Groucho and his brothers (and their writers, who among others included the brilliant Pulitzer-prize winning George S. Kaufman) had plenty of inspiring material throughout the 1920s and 1930s: the irrationally exuberant Florida land speculation and crash (Coconuts, 1925); modern sexual norms (Animal Crackers, 1928 and countless others);* the dangers of fascism and political extremism (Duck Soup, 1933); the sanctity and stuffiness of academia (Horse Feathers, 1931). The brothers knocked countless themes and twists of contemporary life off their pedestals and gave them a good beating. Whatever it was, Groucho was against it! The Marx Brothers were ahead of their time, but also very much of it. Having a sense of humor is a sign of intelligence. The ability to laugh at yourself (and your life) is the opposite of arrogance and being a big fat hypocritical bore. Maybe the Federal budget (among other things stuck in America’s political morass) would get resolved faster if we forced our legislators to sit in a darkened theatre together with some popcorn to watch Duck Soup. *dates are when Coconuts and Animal Crackers first appeared on Broadway, not on film. Remember “This is the Week That Was” on TV?–Goldie Hawn, Lillie Tomlin, David Frost, Smothers Brothers et al—you might be too young. They were a precursor of SNL, and an offspring of the Stooges. Hi Dottie – I am too young; I don’t remember it but there are so many examples – I’ll have to look that show up on YouTube. Okay. It’s been WAY too long since I’ve watched the Marx Brothers and I know my kids would love them too. I feel a fiesta coming on! Thank you for the reminder! Thanks for reading and commenting on my post 🙂 I’d be interested in hearing how your kids react to the Marx Bros. It’s time to indoctrinate a new generation to their fabulousness. I’m wondering which of their movies to watch with my kids first. Remember the mirror scene in Duck Soup?